Bangkok (VNA) – The 23rd ASEAN Finance Ministers’ Meeting (AFMM) and the fifth ASEAN Finance Ministers' and Central Bank Governors' Meeting (AFMGM) took place in Chiang Rai, Thailand, on April 5 under the chair of Thai Finance Minister Apisak Tantivorawong and Governor of Thai Central Bank Veerathai Santiprabhob. A Vietnamese delegation led by Finance Minister Dinh Tien Dung and Deputy Governor of the State Bank of Vietnam Nguyen Thi Hong attended the events. Speaking to participants, Minister Dung asked ASEAN to continue with its reform measures to support regional resilience in infrastructure, capability of financial access, labour output improvement, renewal promotion, and business environment. The Vietnamese side acknowledged the result of negotiations on financial services under the ASEAN Trade in Services Agreement (ATISA) and lauded member states for agreeing to ensure the principles of “cautious management” and “fiscal space” in financial services. Vietnam called on the bloc to maintain such stance when negotiating new and upgrade free trade agreements, including the Regional Comprehensive Economic Partnership (RCEP). Minister Dung spoke highly of regional business environment thanks to drastic reform in trade facilitation, simplification of customs procedures and application of information technology. He expressed support for the goal of connecting all member countries in the ASEAN one-stop shop and announced that Vietnam is ready to join pilot projects in the ASEAN Customs Transit System. Vietnam is working to refine legal framework for the development of green capital market products, including green bonds in the country, he said, adding that Vietnam welcomes the adoption of the Roadmap on ASEAN Sustainable Capital Markets. The meetings reviewed the outcomes of financial-monetary cooperation in the region with an aim to maintain ASEAN economic growth, ensure financial stability and achieve priority goals of enhancing connectivity, sustainability and financial resilience. 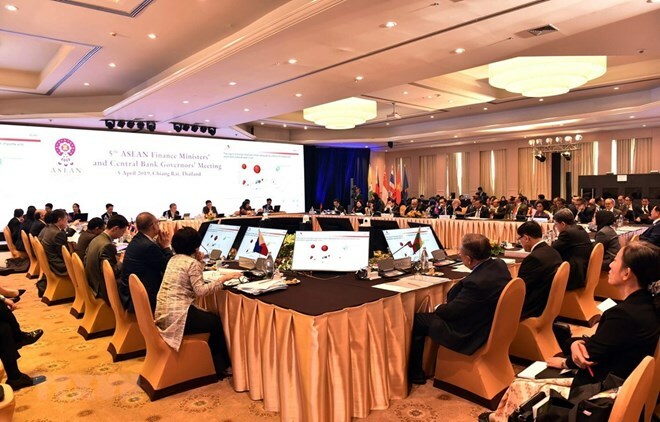 Finance ministers and central bank governors discussed regional and global economic growth, the progress of the implementation of ASEAN financial and monetary cooperation initiatives. They noted that ASEAN continued to grow by 5.1 percent in 2018, which is forecast to stay at the same level in 2019 and about 5.2 percent by 2020. Key infrastructure projects, trade promotion and international investment are expected to be engines of regional economic growth. Participants were cognizant of the downside external risks and pledged to stay ready to make appropriate policy responses needed to sustain growth and maintain stability in the regional financial system. The ASEAN 3 Macroeconomic Research Office was assigned to monitor the economic and financial development in the region. Officials welcomed the notable progress in financial services liberalisation with the signing of the Protocol to Implement the Eighth Package of Commitments on Financial Services under the ASEAN Framework Agreement on Services. The Protocol underscores their strong commitment in advancing regional linkages by further opening market access in the financial services sector. They lauded efforts to continue promoting liberalisation of financial services via negotiations on the RCEP and the ninth Protocol. ASEAN finance ministers were pleased with the progress of customs cooperation, particularly with ongoing development of the live operation of the ASEAN Single Window (ASW) in hope that ASEAN member states will join in the exchange of the ATISA e-form D via the ASW. They welcomed the launch of the ASEAN Capital Markets Forum (ACMF) to facilitate cross-border movement of investment advisors. Participants reaffirmed commitment to accelerate infrastructure development and financing in ASEAN through the mobilisation of private capital. They noted the ASEAN Infrastructure Fund’s two innovation windows, including Inclusive Finance Facility and the ASEAN Catalytic Green Finance Facility. They welcomed the close collaboration and the joint initiative between the ACMF and the Working Committee on Capital Market Development on infrastructure financing and sustainable financing. Concluding the events, they issued a joint statement reaffirming the commitment to pursuing an integrated ASEAN to support economic growth and strengthen regional financial stability amid increased instability arising from trade tension and developed countries’ policy adjustments. They welcomed Vietnam’s host of the sixth AFMFM and the assumption of its Chair by 2020. In an interview granted to Vietnam News Agency, Minister Dung talked about preparations for the AFMM and AFMGM when Vietnam takes the role of ASEAN Chair by 2020.